Ruins of Wilton Castle belonging to Sir [Step] Fox Bart. bl.uk > Online Gallery Home	> Online exhibitions	> Topographical drawings	> Ruins of Wilton Castle belonging to Sir [Step] Fox Bart. 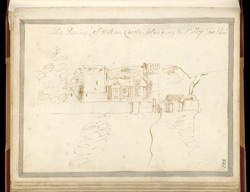 Sketch of the ruins of Wilton Castle at near Redcar. This is presumably the remains of a medieval building, possibly a castle or fortified manor house. Langdale's Yorkshire Dictionary (1822) reports 'At the western extremity of this village, formerly stood the ruins of Wilton Castle, the baronial seat of the Bulmers, an ancient family of great reputation and large possessions in Yorkshire, and the county of Durham'. The Bulmers lost their estate and in the 16th century it was given to the Cornwallis family. Lord Cornwallis sold the estate to Sir Stephen Fox, father of Henry Fox, the politician. In c.1810 a country house was built here by Sir Robert Smirke, in the style of a castle.